Hello there guest! Welcome to _reddyeddy_'s book of Pet Pages. Which Is run by Me (_reddyeddy_) and my owner chocolate_529! Thank you for visiting! I would also like to thank Psapug at Spontaneous Designs for making me this petpage layout. Also, the code for the Neohunt is "chains". To go back to the home page click here. Eddy: Well This part i am going to tell you a little a bout me, _reddyeddy_ and maybe...JUST maybe I will talk about my owner, Chocolate_529. Chocolate_529: Eddy! We don't Have any cookies! Eddy: Yes we do :D In the cookie jar...Duh! Eddy: MOVING ON! I bet you want to know stuff about me guest! Eddy: So-Oh I get it! I look like a cloud so I can disappear like a cloud and...and I always win because no one sees me since I disappeared and flew away! WOW! COOL!Bye guest! Chocolate_529: What you don't say bye to me!! But Eddy wait! The reason why you always win is *lowers voice* because you LOOK... Whats the use... Well guest, I guess I will take you around _Reddyeddy_'s Book of Petpages! I was added to Ellie's Help Guide! I added a font site! I added a Ranking site! I added a layout site! I added a review site! A petpage layout site, Latin Layouts, has changed its name to Pretentious and now does userlookups, button requests and icons as well! I added a link directory! I added a guild directory! I added a site that makes shields! I am now listed at Meepits are Love! I added an Adoption Agency! I added a Button request site! Sorry I haven't been on i a long while! I probably won't be on much (as I have said) but I am still accepting requests! Gummy Bear has also closed. Sorry with the end of summer/beginning of school I have not been on! I will not be on so much because of school work so do not be alarmed if I do not add your site for a couple of weeks. Sorry for the inconvenience! I added a Button contest site! I added a Petpage Layout site! Wow, sorry everyone, I haven't updated in a while! I added a graphics site! Riverdance Pixels has been taken off the site due to it's closure. Button Request page and a Pet Directory page. I added a Pixel site! I added a pet directory! I got reviewed by The Gummy Bear! (I scored 86%)! I asked to be reviewed by The Gummy Bear! I asked to be listed at Faerie Direct! I added a graphics site (icons, backgrounds and pixels) site! I added a directory (pet). I added a pet directory. I added an adoption agency. I am now listed at Secret Observer! I am hoping to be listed at... Secret Observer! I have added a new pixel site! I added a new site. Wow I have not updated for a very long time! I added 2 more pages and one new affie! If any one knows the code to make a link open in a new tab/window can you Neomail Me? Thank you. Added a "Listed At..." section. Today I added 2 new sites (see them in the "New pages..." section. Added a "Pending" section under "Reviewed at..."
I really need to update more often! If you ever notice that I have not updated for awhile then neo-mail me! Happy belated Illusen day! Hope you had a good one! _Reddyeddy_'s Book of Petpages got over 1000 reviews! Thanks for the views! When _Reddyeddy_'s Book of Petpages gets over 1111 views I will start changing the links so they open up a new tab instead of a window! Yay! I haven't updated for awhile! When I get 1000 views I will add a "Newly Added" section were I will put the newly added pages. Got over 700 reviews! WOW thats a lot! thanks for the reviews! Got reviewed by Abby's Reviews (96/100)!! 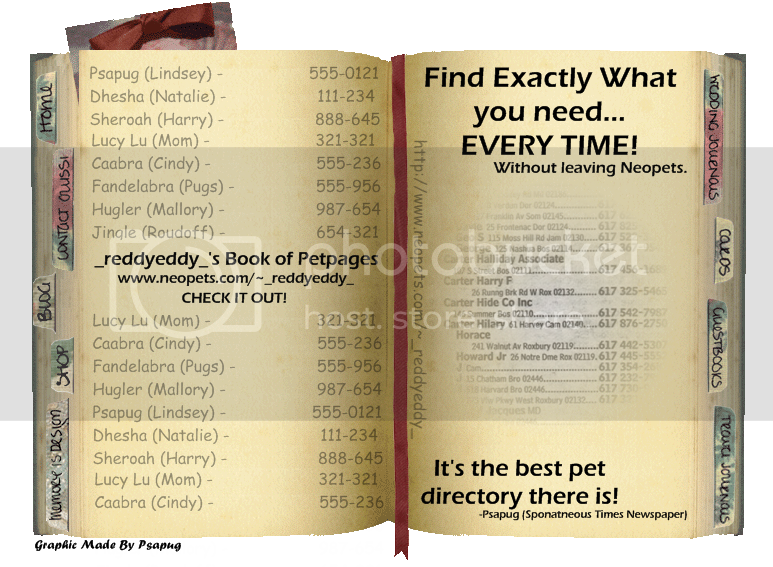 _Reddyeddy_'s Book of Directories has got over 500 views! WOW! Thanks for the views! Nov.22,2008: I haven't updated or have been on lately so i may not answer neomails right away. I added a few sites... 5ish. Added a graphics site Strawberry Soda Graphix. Added a directory (Neopet theme) Cloud Club. Added a pixel site Starryneo Pixels. No 'E' Pages! :o Do you have one? Neomail me Titled "'E' Page!" No 'O' Pages! :o Do you have one? Neomail me Titled "'O' Page!" No 'Q' Pages! :o Do you have one? Neomail me Titled "'Q' Page!" No 'V' Pages! :o Do you have one? Neomail me Titled "'V' Page!" No 'X' Pages! :o Do you have one? Neomail me Titled "'X' Page!" No 'Y' Pages! :o Do you have one? Neomail me Titled "'Y' Page!" No 'Z' Pages! :o Do you have one? Neomail me Titled "'Z' Page!" The first one is from kittycatisginger18! These buttons are by psapug! This next one is done by jogglystrantensoreur! This next one was a gift button by evileh! Just Neomail Me If you want to be an affie. If you wanna join this page use this form. Just copy it into a neomail and fill it in. If you want you can make the application a bit different but make sure to include the 3 basic things! If you are (for any reason) changing the site name, categories, url or are getting rid of your site all together Neomail Me Here using this form. Feel free to add any extra information that you would like to add! HUGE thanks to Psapug at Spontaneous Designs for making me this petpage layout. She coded everything so all I had to do is add the petpage links. She made the navigation and everything. You should defiantly check out her site, IT'S AWESOME! I would also like to say sorry to littlemodle because i put her site Strawberry Soda Graphix under guild layouts instead of General Graphics. Well here are the sites i was reviewed at! !